Within the bounds of modern human cognition, the circle is the most basic – but also the most perfect – shape. I really enjoyed (and highly recommend) the recent New York Times piece titled “The Circular Logic of the Universe” by Natalie Angier. In this article, Angier makes reference to circles of both natural and man-made origin, discussing their physical characteristics and their often debated meanings. 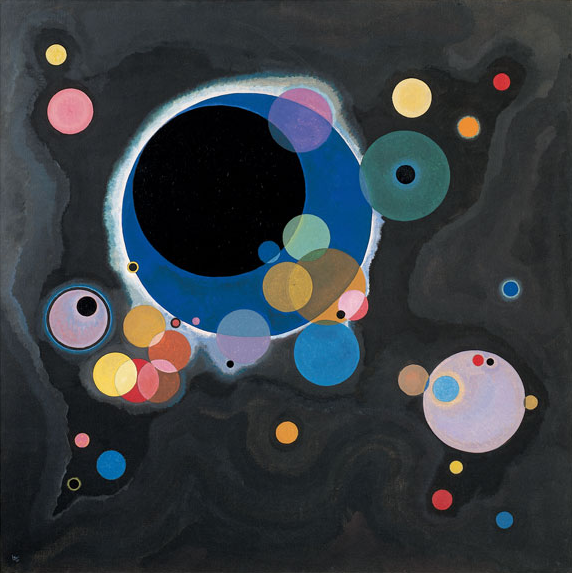 Angier also uses the Russian artist and theorist Wassily Kandinsky‘s piece “Several Circles” (image above) as a foundation for her article. Wassily Kandinsky found interest in the abstract and concrete nature of shapes, delicately balancing geometry as a science and an art. Some of this stuff is pretty wild if you take a moment and think about it. Circles are everywhere and have been researched for millennia. The earliest known use of the wheel was around 3500 B.C. My current reading “Of Men and Numbers” by Janet Muir talks at length about Archimedes’ (and others’) mathematical discoveries and engineering feats regarding the circle well over two thousand years ago! Fast forward and we are still researching and finding new meaning in circles today – in engineering, cosmology, social science, mathematics and every other knowledge branch. I guess it’s safe to say that new questions will continuously arise for which we may never find an answer – for all things, circles included. No matter how simple they seem or how perfect they look, the wheels will always go round and round.